Leader Nancy Pelosi hosted a reception honoring women veterans for their service to our country in Statuary Hall of the US Capitol. 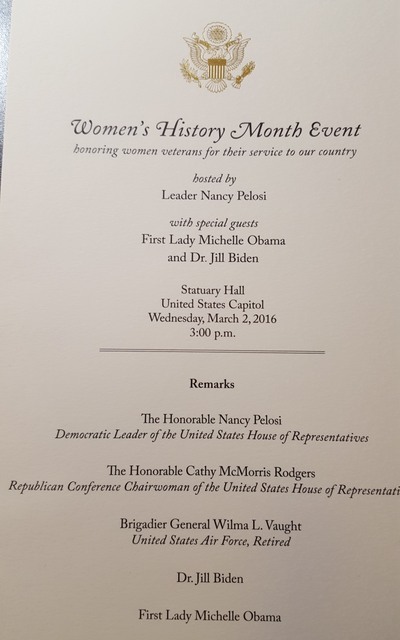 Special Guests included First Lady Michelle Obama, Dr. Jill Biden, Honorable Cathy McMorris Rodgers, BG Wilma Vaught and Senator Elizabeth Dole. I attended along with several veteran members of The American Legion National Staff. Date(s): 3/2/2016. Album by Mike Rohan. Photos by Mike Rohan. 1 - 21 of 73 Total. 383 Visits.